Ligonier Camp and Conference Center, located in the Laurel Highlands of western Pennsylvania just outside Ligonier, is an interdenominational ministry of First Presbyterian Church of Pittsburgh. Begun in 1914, the camp's rich history of ministry has reached campers across the United States and abroad. Now, more than 100 years later, God has continued to be faithful to the ministry happening here at Ligonier. With summer camp sessions frequently full to overflowing, an outstanding adventure education program, a beautiful lodge and conference center, and over 500 acres of rustic property including our separate property with a 26 acre lake, our ministry here at Ligonier Camp continues to reach more and more people every year. The mission of Ligonier Camp and Conference Center is to provide people with reflective and recreational opportunities that will build faith in Christ, self-esteem and supportive relationships. The Bible is the inspired, only infallible, authoritative Word of God (II Timothy 3:16). There is one God, eternally existent in three Persons: the Father, the Son, and the Holy Spirit. The three are of one substance, equal in power and glory. The Holy Spirit indwells all true believers, and it is by His power that they are enabled to live a godly life. Christ has established a visible church which is called to live in the power of the Holy Spirit under the regulation of the authority of Holy Scripture. Ligonier Camp & Conference Center is not a church, but a resource to churches. It is our desire to build churches by accomplishing our mission. As early as 1914, the First Presbyterian Church owned and operated an organized Camp as an extension of its ministry to the city of Pittsburgh. A number of different sites, including Conneaut Lake, Ashtabula Harbor and Silver Lake were used for brigade encampments before the purchase of "several acres of sandy soil, located high on the Chestnut Ridge in the Allegheny Mountains, and bordered by the refreshing waters of Indian Creek." "The Camp is well worthwhile - physically, mentally, socially, and spiritually. Those in charge not only point out the great wonders of nature and God as the Creator, but they are also mindful of the primary objectives of the Church--to lead the campers to a personal relationship with God as their Heavenly Father through His only Son, as their Saviour." The Indian Creek location served the needs of the Camp for over twenty years; however, in 1936 the Camp property was seriously damaged by flood water and, although the Camp was made ready for the oncoming season, the Trustees began a search for a more favorable site. In the next few years, deforestation of the nearby mountains, frequent flooding and increasing difficulty of access made the procurement of another property essential. In February of 1938, the 141 acre Wiley Byers Farm was found and purchased at a cost of $14,000. Resting on the banks of the Upper Youghiogheny River, two and a half miles south of Somerfield, the property was an unusual balance of mountainous wooded areas, rolling hills and beautiful level fields. In the fall of 1942, the Harry Denny Estate, located a mile and a quarter north of Ligonier became the newly acquired property of the First Presbyterian Church of Pittsburgh. It is on this consecrated piece of ground that the present camping program moves forward as an integral ministry of the First Presbyterian Church. 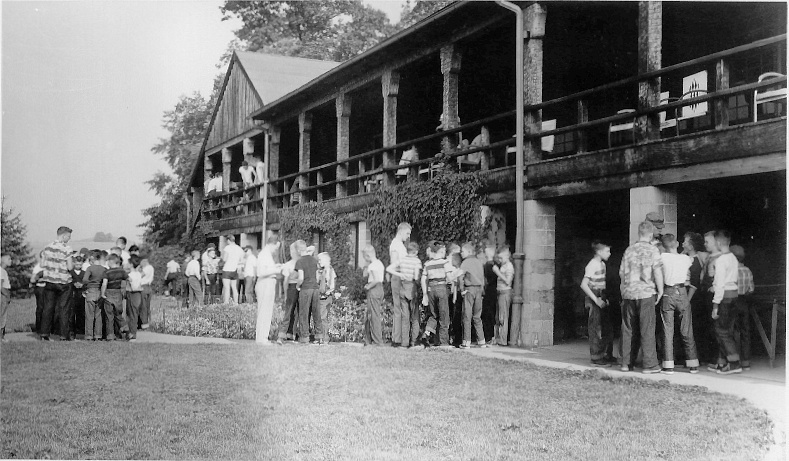 In 1989, after 75 years as First Presbyterian Church Camp, the name was changed to Ligonier Camp and Conference Center. The current summer program incorporates challenge, many group building activities, and a variety of two-day, one-week and two-week sessions for ages 6-17. At the heart of our summer program are our wilderness activities, which encourage setting individual goals and learning to work in groups. As did those who pioneered before us, we believe that at the very heart of everything we do--at Camp or elsewhere--there must stand One who gives meaning and direction to our lives. With this thought in mind, we as staff make every effort to continue to lead campers to a personal commitment to Jesus Christ, and encourage continued growth in the knowledge of and obedience to the will of God.